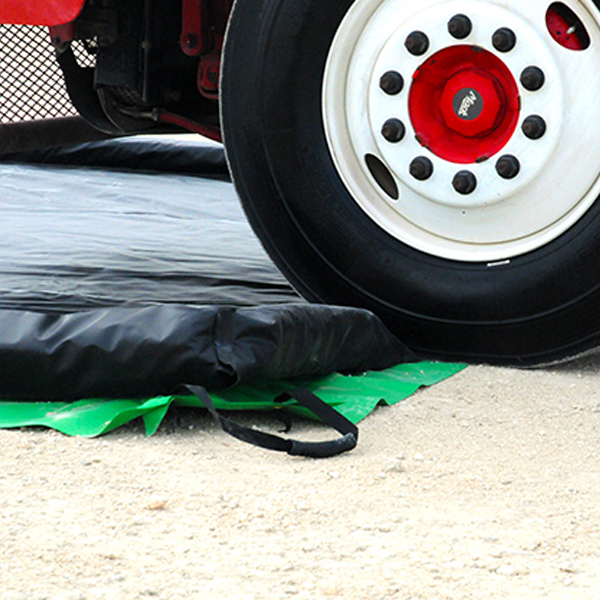 The Ultra-Containment Berm, Foam Wall Model provides containment for smaller spills, leaks, and drips. The 4”H sidewalls may mean a lesser capacity than its 12”H counterparts but it also means versatility and convenience. The Foam Wall Model has true drive-in and drive-out capability and requires no setup other than the initial deployment. Capture nuisance leaks and spills from vehicles, oily equipment, tanks, and drums. Choose from several standard sizes to meet your spill containment needs – custom sizes also available. No set-up required – simply unfold for quick deployment. Folded units require minimal storage space. Available in Copolymer-2000 or PVC (24 mil) – withstands the rigors of industrial and construction applications.